Beyond the Canvas, Art for Social Change. I have always felt that artists of our time have the social responsibility to use art not to just reflect the world around them but to engage the world around them in that reflection. This is why I was so happy to be awarded (together with Pathways to Education) this years Community Arts Grant by Toronto Arts Council. This grant allowed us to create a program of almost 5 months that allowed a group of grade 9 students to use sneaker art and installation to tell their stories of the world around them. As the workshops progressed we decided the shoes were a symbol of who we each were individually thus allowing the student full creative freedom in designing something that spoke to them and represented them. The sneakers were later to be turned into an installation which we wanted to be a reflection of the community of Regent Park (which the youth are from) and what that community means to them. Originally we were planning on doing an installation with recycled art found within the community, but near the end of our program a young man who was just 18 years old was shot and killed in the community. This had an effect on the whole community and we decided to use art as a way to offer healing and respect. 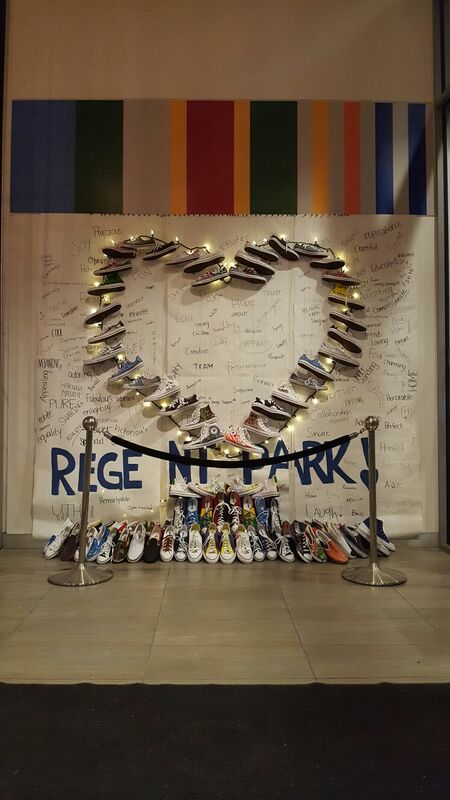 The panels hung behind the shoes became a language of support which youth filled with words describing the community and showing that Regent Park is a wonderful, loving and caring community. The shoes were hung in the shape of the heart in honor of the young man that was killed and to remind everyone of the power of love over hate. The installation was placed in the Daniel Spectrum, a hub of arts and creativity in Regent Park as part of February Black History Month Celebrations. When artists step out of their studios and begin to engage with communities, this is when art truly becomes a representation of the world around us. I feel it is important to maintain this balance and use our art as a way to create access points for creativity to become an every day reality for all people. I feel honoured to have been able to run this program for over two years now across 5 of Toronto's priority (low income) neighbourhood with more than 200 youth. Sometimes all it takes is the passion of the youth, the comittment of a few key community workers and an artist to create small changes with big impact. Thank you to Pathways to Education, Toronto Arts Council, Daniel Spectrum and Si Vous Play Sports for making this project a reality.